Spotlight doesn’t always guess correctly when it comes to what you’re searching for. In fact, some searches yield more than 20 possible outcomes, and you need to sort through Spotlight’s search results. Spotlight isn’t always going to get the Top Hit right, so it also displays what it considers to be the next 20 most likely matches, are segregated into categories (Applications, Documents, Folders, PDF Documents, Music, Messages, Images, Movies, Bookmarks, and so on). Just click an item to launch or open it. When your search yields many possible outcomes, click Show All. Surprisingly enough, clicking Show All doesn’t show you everything. 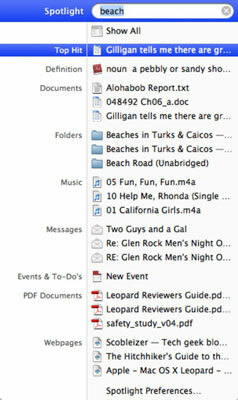 Instead, Show All opens a separate Finder window. The most probable search results in each category are listed, followed by an indication of how many more results are in each group. Click the more line to scroll through the list of other possible search outcomes. If you get a flood of results and aren’t sure which is the one you’re looking for, Spotlight provides a good spot to use Leopard’s Quick Look feature. Just click the Quick Look icon and, well, have a quick look at the sorted files until you find the proper one. Spotlight is arguably the quickest way to launch an application. Just start typing its name into the Spotlight search field, and it should show up as the top hit after only a few letters (and sometimes a single keystroke). Press Return to launch the program. 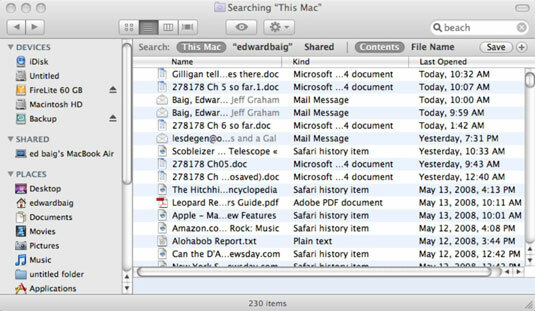 Spotlight is able to search so quickly because it indexes, or catalogs, all the files on the computer. The index is seamlessly updated each time you add, move, modify, copy, or delete a file. Spotlight also automatically rummages through metadata, the information about your data. Digital photographs, for example, typically capture the following metadata: the camera model used to snap the image, the date, the aperture and exposure settings, whether a flash was used, and so on. For example, if a friend e-mails you pictures taken with a Kodak camera, you can quickly find those images by entering the search term Kodak.